Rely on our mold design expertise. 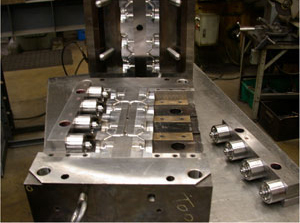 It all begins with a robust mold design. Because without a good mold, there is no way we could manufacture the high-quality plastic parts synonymous with Van Norman Molding. In fact, many of our high-capacity molds deliver more than 15 million parts per year. Focusing first on a robust part design lets us provide a solid mold design, which gives our customers the high quality plastic parts they need to succeed. Our cross-functional design team, made up of representatives from our engineering, tooling, manufacturing and quality assurance departments, oversee every mold from design to build to prototype to production. With our in-house mold shop, we have complete control over the entire process, including steel selection, heat treatment, machining, polishing and plating. From the simplest molds to complex, multi-cavity high-production molds, we can guarantee our new molds for a minimum of ½ million cycles and more. Quality and maintenance are key.